Hi everyone, I'm here today with a JustRite Papercraft project and I have to tell you, I'm absolutely in LOVE with this new Three Way Roses set! You can do sooo much with it, design your own layouts/patterns and decorate the roses anyway you like. I also used one of the sentiments from JR's new release, "Lost Without You". I'll post both sets with a link to the shop below. I started with a 5x5 card base and cut a stitched square of vanilla cardstock that is 4.75" squared. I gathered up a bunch of my inks in reds and pinks and started stamping out all 3 flower background sizes randomly. I added leaves and twigs to my design and decided to heat emboss the largest flowers using gold embossing powder. I did a little white paint splatter on the flowers I didn't emboss. I finished with some Pretty Pink Posh gold 4mm sequins around the flowers. Thanks so much for stopping by, please leave a comment as I love to hear from you! 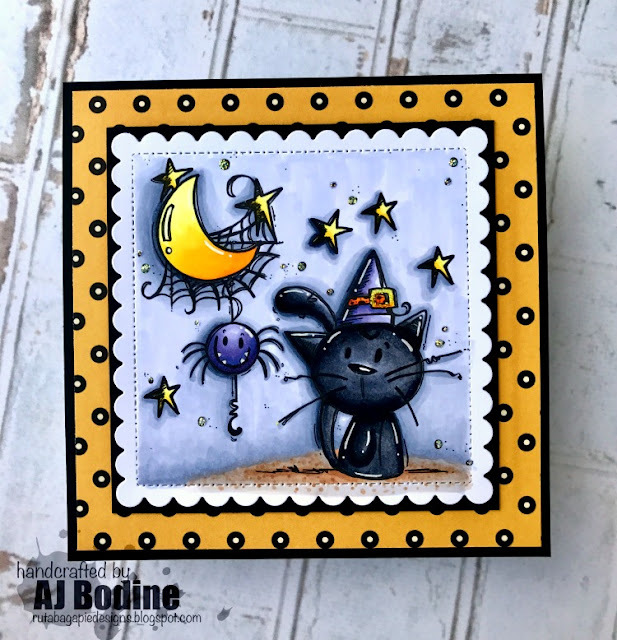 I had SO much fun creating that first Halloween card using Bugaboo Digital stamps that I felt like creating a second. This time I used 2 different sets of digi stamps to create my scene. I pulled the bat from set 1 and the pumpkins from set 2! I started by die cutting my scene using a Gina Marie Designs slash stich rectangle die, then inking my background with Wilted Violet distress ink and the cloud stencil by MFT . Then I did a 50/50 ratio of white acrylic paint and water and splattered it on my spooky, halloween-y night sky! I found the little banner strip in a 6x6 Doodlebug paper pack from last year called "Boos and Brews" and glued it down below. I finished the card with a twine bow tied around a button and the die cut "Hello" by Simon Says Stamp, layered in black and white to really make it stand out! Here's a link to the shop, https://bugaboostamps.com/hurry and grab these while they are 50% off!!! Thank you sooo much for stopping, I'd love to hear from you, so please leave a comment!! Hi everyone, just a quick pop in here to show you a card I've made with a new digi stamp that was just released over at Bugaboo Stamps. This one is called Halloween Spider Kitty. It appears that there are 4 new images/sets and they are currently 50% off and you get both a .jpeg and a .png file, which I LOVE that. I die cut the scene using a scalloped square die by Gina Marie Designs. I copic colored all the images and background. The paper is from my stash, I found it in an older American Crafts 6x6 pack. I layered it to really make the scene stand out! Thanks for stopping, please leave a comment as I love hearing from you! 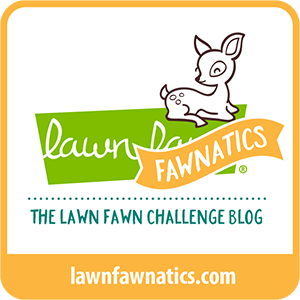 I've entered the following challenges with my card! Hi everyone! 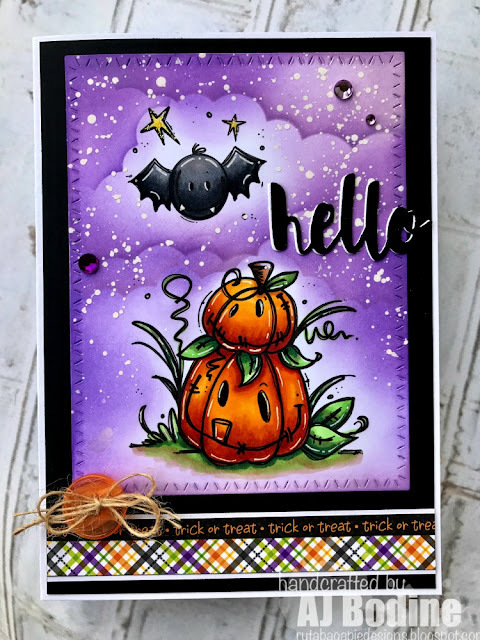 I am soooo excited to be sharing this card with you that I made using Newton's Nook and Chibitronics products! My card is a 4x6 size, which is unusual for me, but I think it's the perfect size for this scene. CHECK THIS OUT! When I press on the pumpkin in the lower right corner, the owl's eyes light up!!! I'll make sure to write that inside the card, so the recipient knows to push on the pumpkin! Leave a comment on the NND & Design Team blog posts using Chibitronics products all week (Aug 21-25) to enter. One winner will be randomly chosen from blog posts throughout the week so the more posts you leave comments on the better your chances are of winning! You have until Friday August 25th at midnight CST to comment. The winner will be announced on the NND blog post on Monday, August 28th. Hi everyone! 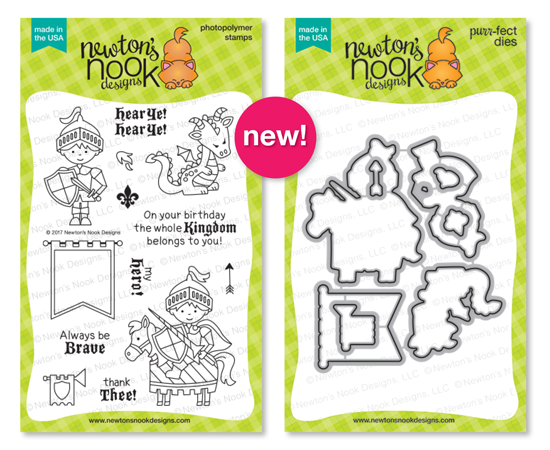 Welcome to day 4 of the Newton's Nook Designs August Release! Today we're featuring this super duper adorable new stamp/die set, "Autumn Newton". I've made 2 cards for today's post, and I'm so excited to be working on some fall cards after our scorching hot summer! I just love the images in this set, the pumpkins, gourds and corn shocks are great compliments to the sweet little Newton images! All are Copic Colored and paired with patterned papers and diecuts! I hope you like my cards, keep scrolling for your chance to win this stamp set!! 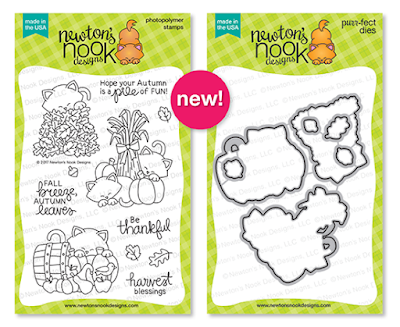 Would you like to win the “Autumn Newton” Stamp Set? 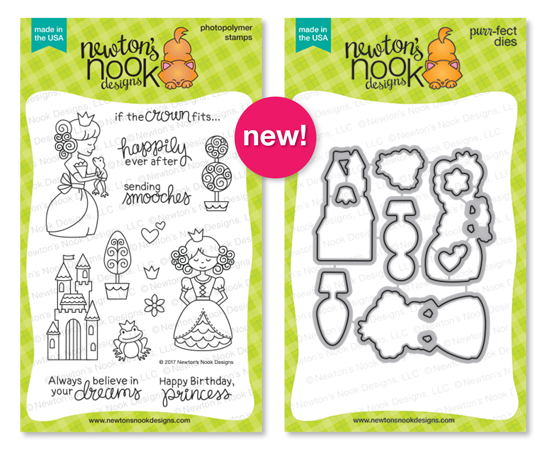 Hi everyone, I'm here today, Day 3 of the Newton's Nook Designs August Release! Today we've got this adorable set, Knight's Quest stamp and die set to show you. I just love that little boy's face, he was so much fun to color as well as the horse and banner! And don't you just LOVE the sentiments that come with this set? After I copic colored the images, I die cut them and created this sweet scene I added some enamel dot to finish it off. I hope you love my creation, please keep scrolling for your chance to win! Would you like to win the “Knight's Quest” Stamp Set? 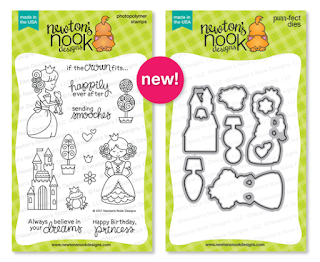 Hello everyone, today is Day 2 of the September Release at Newton's Nook Designs! Today we're featuring this SUPER ADORABLE stamp/die set, "Once Upon A Princess". This was so much fun to create with and so perfect for little girl cards..and big girl cards too! I started by cutting out background paper with a rectangular stitched die..I used paper from the Lawn Fawn Watercolor pack. I cut the hill using the Land Borders die by NND. I copic colored all the images and then diecut them out using coordinating dies. I had a lot of fun creating this simple scene, I hope you've enjoyed my project, make sure you comment to win and visit the other DT's blogs below for the most chances to win! Hi everyone! Today is Day 1 of the Newton's Nook Designs September release and omgosh, aren't you so excited to see Unicorns?!?! I created the sun-ray background using distress inks, then used the NND Starfield Stencil over the rays with Nuvo Mousse in silver. I die cut using the matching dies, then Copic colored the unicorn and rainbow clouds. 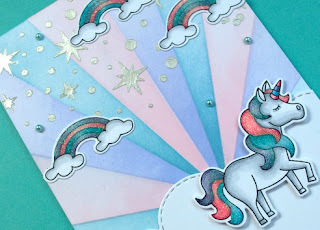 I then added clear glue and glitter to give the mane, tail and rainbows lots of sparkle. I also used the NND Sky Borders Cloud die and foam mounted my unicorn in the clouds! Thanks for joining me today, be sure to keep scrolling to learn how to win this stamp set! Amanda Bodine - You are Here! Newton's Nook Designs and Xyron Collaboration! 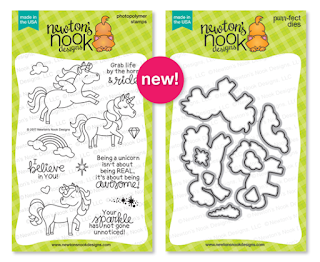 This week Newton's Nook Designs and Xyron are partnering for a very awesome inspiration week! Each day there is fresh inspiration using Newton's Nook Designs products with Xyron adhesives on the NND blog and on the Xyron facebook page! Hello everyone! I started with the NND Winston's Lake House stamp and die set and die cut and Copic colored the images I wanted to use. I inked up my background using Mowed Lawn and Twisted Citron distress inks on the bottom and Tumbled Glass and Chipped Sapphire on top for the night sky. I inked in some cloud shapes using a stencil and once dry, I added some sparkle using Nuvo mousse in silver and the Starfield Stencil by NND. I cut 2 different waves from the Ocean Borders Die Set by NND and inked them up with the same blue colors in my night sky, only much lighter. I laid down strips of tape using the Xyron Mega Runner Tape Gun on the back to adhere them to my circle that I had die cut and inked up with Squeezed Lemonade and Wild Honey. After the waves were glued down, I used my scissors to cut around the circle so the wave border would fall perfectly within the circle..creating the moon behind them. Using my tape gun, I adhered my moon and waves to my inked background, then glued it all down on my card base. Lastly, I stamped the sentiment in the moon using Night of Navy ink by SU. Then I placed and glued down Newton, lily pads and cattails around the water. Thank you so much for joining me today, keep reading..there are prizes!! Here's how to win:Leave a comment on the NND & Design Team blog posts using Xyron products all week (July 31-Aug 4th) to enter. One winner will be randomly chosen from blog posts throughout the week so the more posts you leave comments on the better your chances are of winning! You have until Friday August 4th at midnight CST to comment. The winner will be announced on the NND blog post on Monday, August 7th. Xyron will also be giving away a prize pack! Make sure to visit their facebook page each day this week for inspiration and leave comments there for another chance to win! I wanted to give you a review of the Xyron Mega Runner as this was my first experience using it. I was really impressed by how balanced the gun was in my hand and the tape itself laid down perfectly on my project. No doubt I'll be keeping this tape gun handy in my work space. I'm normally a liquid glue user, so I was also excited to try the Xyron Adhesive Eraser Cube (pictured above). It's awful when glue ends up where it's not supposed to and this seems to happen to me often. This little eraser does the trick! Even with stubborn glue, it lifts off easily..such a wonderful little tool! **As a sidenote, I was given these products to work with for this collaboration, but the opinions I've written here are my own.